Friday is here again! I'm planning to take the kids to the cinema to watch The Chronicles of Narnia - The Voyage of the Dawn Treader this afternoon. Audrey got the Narnia book collection and Andrew loves Aslan. So I'm sure they will enjoy the movie so much. The movie comes in 3D format, so it will be more fun and exciting to watch. I found a birthday gift for hubby already, so this afternoon before watching the movie the kids will have a chance to find theirs too. I made Santa's reindeer for Audrey's bento this morning. And my boy mentioned yesterday that he wanted to bring bento again next semester. I think he heard my conversation with my girl every time in the car when I picked them at school. I always check my girl whether she finishes the bento or not ... and she would told me about her bento, her friends, her teachers in the classroom. I can say that become our little sweet conversation along the way. The boy got jealous? A little bit maybe or he got bored with the school catering already :) Either way, next semester I will have to prepare double bento again for the kids. Inside the box : rice, pork yakiniku, tamagoyaki, carrots, and Chinese spinach. Wish everyone a great weekend ahead! Super amazing reindeer, Lia! You will laugh when you see I made a reindeer too, but it is not like yours at ALL!! In fact, you may not even recognize it. That's why I'm telling you in advance :) Happy Friday! 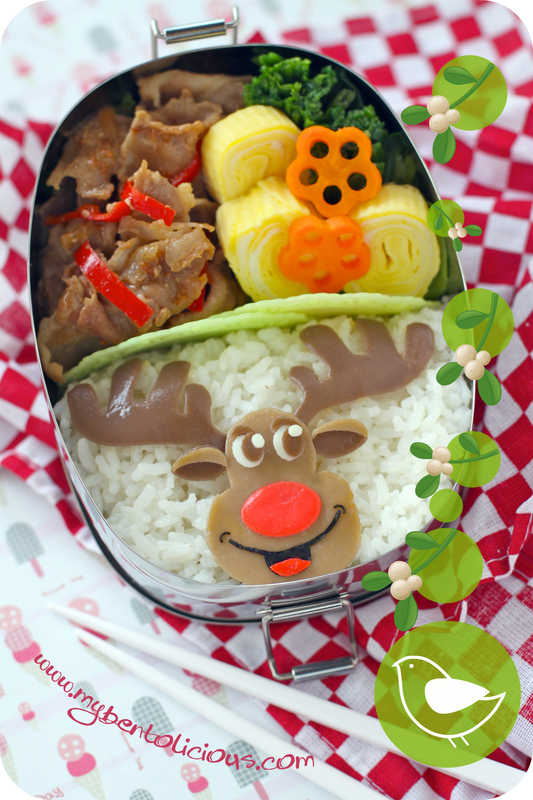 Very sweet of reindeer, Lia..
oh great, double bento, double cuteness. Cute red nose Reindeer, there is egg white layers in the tamagoyaki? can share how to make it? @sherimiya : Thanks a lot Sheri! I don't think I can manage to make 2 different kinds of bento like you. So perhaps I will stick with twins bento that are not too sweet or girly (???) hahaha ... I saw your reindeer over your blog, that is so creative! Can we swap? Your pictures are so stunning! Lia, I love reindeer, super cute. Did you make that egg roll too. @javapot : We perhaps had a same dream the night before hahaha ... Thanks a lot Kirsten! I'm amazed at how much personality your cute reindeer has! His expression is precious!! @bentobird : Thanks a lot Jenn! I will make double twins bento ... So will be exactly the same for both of them. This way I don't need to spend too much time in preparing their bento ;) Have a wonderful weekend too! @Natakiya : Thanks a lot Natakiya! So... double bento coming up? Oh gosh, double art from you in the next semester! Can´t wait to see =). Have a great weekend! Hope friday at movies was fun! LOVE the reindeer! His big red nose is soooo cute! And I am so glad that Andrew wants back in on the bento action. It is interesting to watch our kids think about what is cool and what is not, and to see how they learn to appreciate the efforts and love we give them. Have fun at the movie! I love Aslan, too! @karaimame : Thanks a lot Lilian! Double bento but I think will be the twins design so it's save time to make :) Hope you and family have a great time together too! @VIVILAU : Thanks a lot Vivi! @Tiffany Yang : Sorry for the late reply. I'm still on my bento break until next Monday :) Thanks a lot Tiffany to put the link!